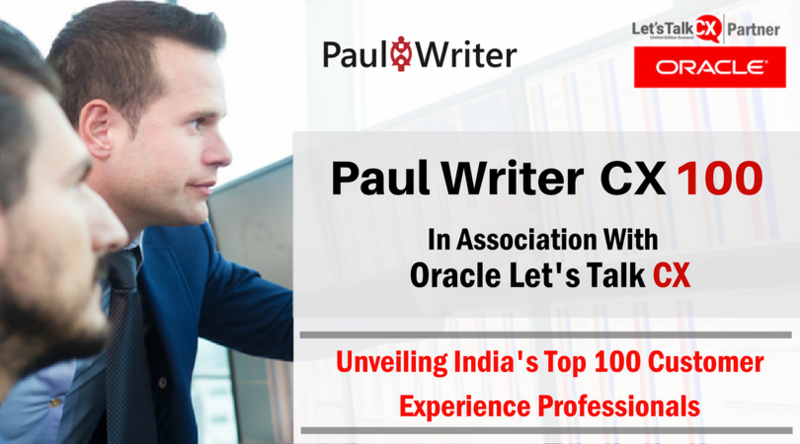 We are delighted to announce Paul Writer CX100 In Association with Oracle Let’s Talk CX, the recognition list of top 100 Customer Experience Professionals in India. CX100 List is unveiled during an evening program at the Futurist Business Conclave scheduled to take place on August 18, 2017, at the Leela Ambience, Gurgaon. Anish Ahuja Head Customer Service Whirlpool of India Ltd.
Dr.Himanshu Dutt Head CRM & Client Experience Bajaj Capital Ltd.
Solomon Wheeler Vice President – Head Marketing at Vistara Vistara – TATA SIA Airlines Ltd.
Sudipta Barua Lead CUSTOMER EXPERIENCE CENTRE & CLIENT VISIT EXCELLENCE HCL TECHNOLOGIES LTD.
Sujit Paul Head – Member Relations & Business Excellence Mahindra Holidays & Resorts India Ltd.
Sunil Kapur Head – Sales Fortis Healthcare Ltd.
Vivek Sharma Chief Revenue Officer Rediff.com India Ltd.